True individual attention. 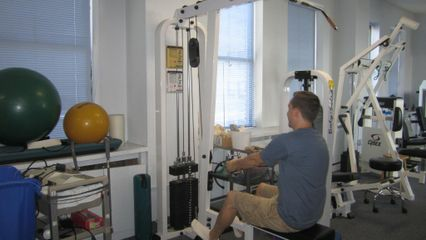 Sports injuries, back and neck pain, joint pain, balance disorders and post surgical rehab. One patient at a time. Every time! Since 1986. We accept Medicare and most major insurance. Michele is a compassionate and skilled Physical Therapist and part of the ProFitness team having extensive experience in treating patients with sports injuries, herniated disc, occupational injuries, pre and post operative rehab. as well as other orthopedic illness and injuries. During her consultations she takes the time to fully explain patients' conditions in order to prepare a treatment program specifically for each patients’ specific needs, capabilities and goals. Her experience and passion for PT has led her to yearly continuing education programs that enhanced her expertise in manual techniques. Ankur began his career working in an outpatient clinic working with various orthopedic and neurological conditions followed by gaining experience in pre and post operative surgical conditions, including joint replacement surgery in a hospital setting. Since technology and methods are constantly changing he continues his education via continuing education classes each year. He enjoys treating a diverse patient population with various orthopedic conditions, including sports injury, pre and post surgical rehab, back pain, gait and balance abnormalities. Ankur incorporates the most current evidence based treatment plans to achieve optimal function and recovery. Dustin has various experience treating post-surgical, chronic pain, pediatric and neurological and sports injury patients. He has treated High School and Divisional college students as well as many pediatric injuries. Since each patient is treated individually, he has the time to listen to each patient and create a unique treatment plan for each patient. Along with sports injuries, he also treats back pain, joint pain, arthritis, and many other orthopedic conditions. As part of the ProFitness team, Dustin has been committed to continuing education on a yearly basis.